I have a problem. I love curry. I love my wok. I have no idea how to cook for one person. Before I moved, I had a bunch of mushrooms that were about to go bad. I also had a bag of frozen peas. And, per usual, tons of spices and curry pastes and coconut milk and the like. Logical conclusion–make curry. It was a great idea until I added too much curry paste, setting my mouth on fire (and mind you, I adore super hot and spicy food), attempted to fix the heat with extra coconut milk (a dash of lemon juice did the trick somehow…I’ve no idea how the chemistry behind that works or if it were a fluke), added chickpeas and some other random odds and ends, and then added cornstarch to thicken it because I had an entire wok full of curry soup. Delicious curry soup, but I wasn’t going for soup at this point. And I had an entire wok full of it. I ate some, pawned some off on friends (not like I was twisting anyone’s arm or anything), ate some more, ate some more. Almost a week later–sick of curry. Sick of curry with two tupperware dishes left of it. Crap. Solution? Let them eat pie. 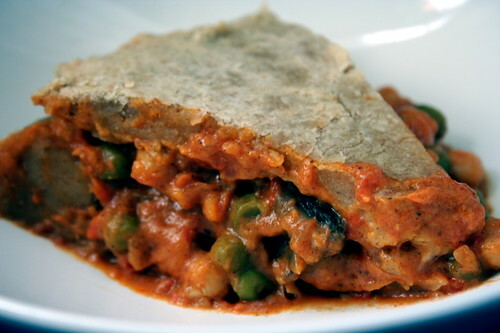 Curry pie. I whipped up some whole wheat vegan puff pastry, rolled it out, lined a pie dish with it, filled it with curry, topped it with puff pastry, and baked it for over an hour. The pastry was thick, so it took forever, but Holy Mary Oh My God the end result was orgasmic. And maybe it was that good simply because I’m a carb fiend and anything in bread is delicious, but damn, I did good. Below is the original recipe I used for the curry. I added much more curry paste than it called for. You can adjust the amount to taste. Oh, and let me tell you, taking a good picture of this thing was not easy. Just trust me: it tastes 800x better than it looks. Clean the mushrooms and remove stalks. Depending on the size, halve or quarter them. Slice the chiles in half, and de-seed them with a spoon. Dice the chiles into small pieces. Dice the onion. Add 1-2 tbsp oil to the pan, add the onion, chiles, and garlic and cook for 2 to 3 minutes, until the onion is clear. Add the mushrooms and cook 3 to 4 minutes until golden brown. Add the spices, peas, chickpeas, coconut milk, and curry paste, and reduce the heat. Simmer, uncovered, 10 minutes, or until mushrooms are tender. If there is too much liquid, add cornstarch a teaspoon at a time, stir the mixture, and allow it to thicken until you reach the desired consistency. Mix the flour and salt with cubed margarine to create cornmeal like texture. Create a well in the middle and slowly incorporate to form a dough. Rest the dough for 30 minutes in the fridge (DO NOT KNEAD!). After 30 minutes, take out the dough from the fridge. Flour the surface of a board, a roller, and the dough. Seperate teh dough into two balls. Roll the each ball into a rectangular with a ratio of 1×3. Fold the it twice to make a square. Repeat it at least 5 times with each ball of dough. Roll out each portion of dough into a layer for the crust bottom and top. My thickness was about 1/8″. Line a pie pan with the dough and fill to brim with curry. Place the other rolled out portion of dough on top to form a top crust. Poke holes or a design in the crust to allow for expansion (you don’t really want the pie to explode, trust me). Bake at 350 for 45 minutes to an hour, or until the crust is light brown. I’ve actually never had curry before (I know! I’m pathetic! haha) – looks delish! ooo, yum! i love me some curry. Curry…and pie?? TWO OF THE BEST THINGS EVER!! Oh man, I really need to make this – thanks for sharing the recipe!! I’d say that’s a pretty delicious-looking picture! I recently fell in love with curries, and should really make them more often… Kudos to you for combining two perfect dishes–PIE and CURRY! What an enticing combination! Hi, nice blog! Very creative to make a pie. I often make crepes to put leftovers in–it cranks up the appeal factor many notches.